Could a new proposed particle help to detect Dark Matter? Researchers at the University of Southampton have proposed a new fundamental particle which could explain why no one has managed to detect 'Dark Matter', the elusive missing 85 per cent of the Universe's mass. Dark Matter is thought to exist because of its gravitational effects on stars and galaxies, gravitational lensing (the bending of light rays) around these, and through its imprint on the Cosmic Microwave Background (the afterglow of the Big Bang). Despite compelling indirect evidence and considerable experimental effort, no one has managed to detect Dark Matter directly. Particle physics gives us clues to what Dark Matter might be, and the standard view is that Dark Matter particles have a very large mass for fundamental particles, comparable to that of heavy atoms. Lighter Dark Matter particles are considered less likely for astrophysical reasons, although exceptions are known, and this research highlights a previously unknown window where they could exist and, with very general arguments from particle physics, derives some surprising results. The proposed particle has a mass of 100eV/c^2, only about 0.02 per cent that of an electron. While it does not interact with light, as required for Dark Matter, it does interact surprisingly strongly with normal matter. Indeed, in stark contrast to other candidates, it may not even penetrate Earth’s atmosphere. Earth-bound detection is therefore not likely, so the researchers plan to incorporate searches into a space experiment planned by the Macroscopic quantum resonators (MAQRO) consortium, with whom they are already involved. 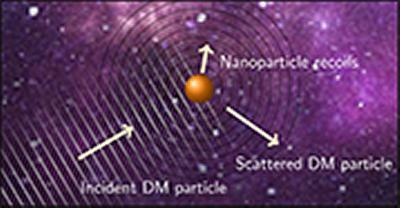 A nanoparticle, suspended in space and exposed directly to the flow of Dark Matter, will be pushed downstream and sensitive monitoring of this particle’s position will reveal information about the nature of this Dark Matter particle, if it exists. Dark Matter may be a problem to be understood by crossing fields and looking for hidden possibilities.